Prince William County moving companies are trying to follow in Able’s footsteps because we’ve been voted “Prince William County’s Best Moving Company of 2017” by Inside NoVA. We have over 30 years of moving and storage experience in the area, and we have plenty of customer reviews and testimonials for you to review to ensure you’re picking the right moving company. If you’re moving in or out of Prince William County, Virginia, we can assist you in your relocation no matter the distance! When you hire Able Moving & Storage to complete your residential or commercial move, you’ll be treated like family, just as every one of our employees is. We take pride in our work, and over the past three decades, we’ve built a reputation we’re extremely proud of. Cameron M. Says “My wife and I were pricing movers and Able was the second company we contacted. From the beginning, Nick left us the impression that dealing with Able was going to be a different experience. He went through the house, outlined their procedures, did his measurements and had a quote for us in less than half an hour. They were able to store our possessions without any problem and a week later, the delivery was handled very quickly and professionally by the same team that loaded it. Your moving company in Prince William County, Virginia, is only a phone call away. Our large fleet of moving trucks are on standby for your next move in or out of the area. The satisfaction we receive from providing exceptional moving and storage services is one of the main reasons we’re in business. Over the years of moving Northern Virginia, we’ve earned a reputation for being affordable, fair, and reliable. If you read our testimonials, you’ll see exactly what we’re talking about. Becoming the best moving company in Prince William County did not happen overnight, in fact, it took tens of thousands of moves in the area to achieve. We’ve always delivered quality moving and packing services to our customers. Taking care of our customers is our main mission, we want nothing more than to remove the worries and struggles of moving! When planning a move in Prince William County, don’t forget about packing supplies. You can get packing supplies like moving boxes and tape just about anywhere, but getting your supplies from Able Moving & Storage will save you time and money! Never underestimate the amount of work that goes into packing. If you don’t leave enough time before your move, you might experience some delays or, even worse, damaged items. We have a professional packing team that can handle all of your packing needs. Labeling our packers as experts would be an understatement. With an average pack-up time for a fully furnished room being around an hour, they are truly professional packers. If you find yourself behind schedule for your move and need help with packing, give us a call! We are ready and willing to lend a hand and speed up your packing process. Typically, moving long distance has more potential of issues than shorter moves. But not with Able Moving & Storage, Inc. We’ve been moving homes, offices, and anything else you can think of across the country for as long as we’ve been in business. That’s over three decades of long distance moving experience! Able Moving & Storage is an independent, family owned, full-service moving company. If you’re looking for a company to trust with your belongings, choosing Able will ensure you get treated like family. Our company has over 200 happy employees, all of which will work their hardest to make your moving experience straightforward and seamless. Since we are not affiliated with any van lines, we can control the process much better, resulting in the best move for our customers. Remember, long distance moving is easy when you choose Able Moving & Storage. Relocation costs can vary significantly depending on the situation. Able Moving & Storage isn’t always the cheapest, but we’re always the best value. We understand that moving can be expensive, but cutting costs by using a questionable moving company without a proven track record usually results in paying more in hidden fees, damaged items, and headaches. With Able, you know what you’re paying for, and you get the highest quality service throughout the moving process. Short-term and long-term storage options are available for the residents of Prince William County. If you’re looking for a company you can trust with your valuables, you’ve found it! We have three warehouses in Manassas, Virginia, fully capable of holding anything you need to store. Access to our facilities is easy, and we’re always adding more space to handle the demand of our clients. We offer tours of our warehouses for those who want to see what condition their items will be kept in. Our company is fully transparent; if you have any questions about our processes, please ask! Hiring a moving company can be a nerve-wracking process. 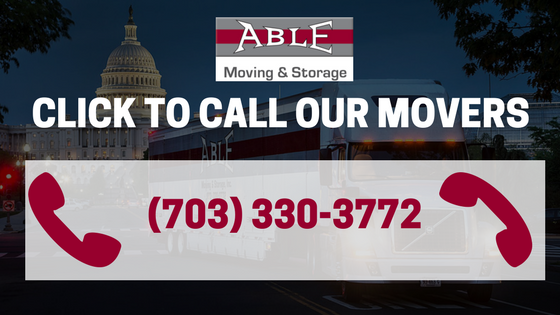 Working with Able will always be a wise choice if you’re moving to or from Prince William County, Virginia, because we’ve got over three decades of moving, packing, and storing experience. No matter what part of the moving process you need assistance with, Able Moving & Storage, Inc. is eagerly waiting to take care of it for you. We’ve developed a reputation we’re extremely proud of, and we work diligently to maintain it.